Hey. Good evening. Get your passports, if you don't have with you then just lay low in the boat and we're gonna cross from Congo to Cameroon. This is one of the last pristine wilderness in the world. So, we're entering into this forest. 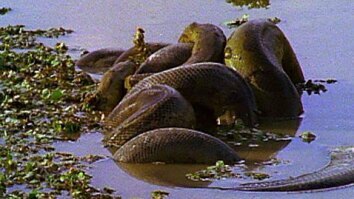 One of the largest snake on record is on this picture. This is the forest floor, what you've just seen from outside. Can you find the snake? If you find it, you're my guest, you know, for a beer after the lecture. So where is the snake? It's very hard to find. It's up here. I didn't touch the snake, I just went above. And here you see the head and the body it just disappears in the leaves. It's a huge animal. It's the Gaboon Viper. It's the snake which injects the most amount of venom, a spoonful, and has the longest fang, up to two inches long. So, you definitely don't want to get bitten by one of these. And you know, globally a 100,000 people die from snakebite and the only reason why they're dying because there is no antivenom. We have the perfect technology to make antivenom but there is just no money in some of these tropical countries. So 100,000 people die from snakebite. But let's go back. Let's come back from Africa here to the US. And, this is Chicago. And we're gonna go to the South Side of Chicago. University of Chicago Hospital. This patient just suffered a heart attack the night before. And his life has been saved by this snake. This snake is a Pygmy Rattlesnake, the source of a top heart attack medication. In the US, out of the top three heart attack medications two of them are coming from snake venoms. So, it's a huge, huge impact. Other than this two medication we have 20 different medicines coming from animal venoms for high blood pressure, for cardiac failure, for cancer and HIV pain, top drug for diabetes. But still in nature we have 20 million toxins left unstudied, in different spiders, scorpions and so on. So, again it's not only snakes, it's sea anemones, different sort of fishes, amphibians, even some primates have toxic secretions. So what we do as pharmacologist is we collect all of these venomous creatures from all over the world, we gather their toxins and we create toxin libraries, and we screen that out of this massive toxin libraries which one is the best match for a target in the human body because that can be a potential future medication. So, in the next few minutes just bear with me and I'm going to show you what it takes to go around the world and collect these toxins because actually the least risky of the whole trip is catching the snake. So, this is the airport in Fiji we landing and at least somebody is waiting for us. But sometimes we do end up in the wrong island. And you know, here, you know, my helper and I, you know, we find human skulls instead of snake eggs what we were looking for. This is in the Arabian desert at the Saudi Arabia-Yemen border. And if you follow the news you know that Yemen is not really a safe place to travel. So I ended up in a military camp and rented Ahmed. This is Ahmed, my bodyguard. And he keeps an eye on me, you can see him, you know, he's keeping an eye on me. And in exchange I had to fed him with Khat, which is a local narcotic just to keep him high. But... what we did... of course he was watching my back, but also what we did, we showed pictures for the locals, you know, asking have you seen this snake and so on. You see a very prominent presence of the AK-47 And there are lots of military checkpoints in Yemen. So, every time we cross one they were asking, “Are you American?” And I said, “No.” “British?” “No.” “Australian?” “No.” And once they run out of countries I told them I am from Hungary. Nobody ever heard of Hungary. But, but... everyone had a Nokia phone. So, I told him pop-up the Nokia phone, because the Nokia was made in Hungary. So, since there is not a single person in the world who doesn't love his mobile phone, so I never ever had a problem after that at military check points in Yemen. We are going a little bit closer to the US, this is, this was just a couple of months ago. The only way to get into the rain forest, either you have to fly in or you take a boat. As you can see here the dress code is pretty liberal. And, the TSA is not really in charge here because this is a deadly blowgun. So this is the Guaraní Indians' territory at the Ecuadorian-Peruvian border zone. And they're using these blowguns to hunt for monkeys. But we ended up actually traveling with the dead tapir killed by a jaguar. And you know, fall into the water, was rotting and bloated and floating on the river. So, we chopped it up this tapir and this is how we continued our trip. But take a good look of this engine because that engine was gone by the night. It actually fall into the river. So, I said, “God this is great.” You know, we are in the middle of the Amazon and you know, this engine just falls into this river and it is as you see it's not really crystal clear water. So we were trying to recover the engine, couldn't find it, had to sleep on the river bank. Next morning we're trying to get the engine. We're trying really, really hard. It's pretty hopeless but you know, finally we actually find it. And made into the village, the Guaraní village along with the tapir you know, he's cooked. So the night is coming, so we've to consider our options. And this is the typical campsites. So, here is the-- my hotel suite. This is my bedroom, this is my study and the kitchen. I'm not picky. I really sleep anywhere you know, when the night is coming. Talking about cars, I like to give ride for hitchhikers. This is in Kenya, the Kenya-Sudan border. And you can see that this lady, this Kalenjin lady she is all smiles here and she's a little bit concerned on the right side. Well, the difference between the two pictures that here I informed her that she is sitting next to 13 vipers. If you have some surgery background it helps, you know, to fix the puncture in remote places in Africa. And sometimes we do stay in hotels until we're being kicked out because of the snakes. And here you can see that this is in Yemen, back to Yemen. And, just in case, the AK-47 is standing by. Alright, so, so we get there we made friendship with the locals and the military. So let's, let's look for some snakes. Well, we have still other problems like elephants. This is in the Congo basin rain forest again. So, I was standing on a termite hill try to take a picture of this elephant, was eating the other part of this bamboo. Then it came so close, put up the four feet in the bottom of the termite hill and I was thinking, God this is the end of my life. I mean it was literally like a few feet from me. So then my guide who used to be a poacher was standing on the other termite hill was whispering something to the elephant. So then elephant turned away and now I had courage to take a picture of his behind. This is in Solomon Islands, Australia. The crocodiles are a big problem. So this is the crocodile nest. And the reason why the mother is just lunging out because I asked my field assistant, that's a technical term for girlfriend, to check out what's happening in the crocodile nest. So then you get into real problem when you get bitten by a snake. So, I was bitten six times before. 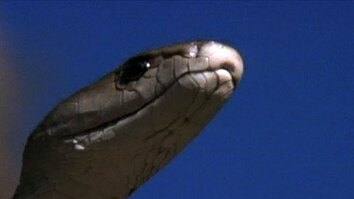 I had a Spitting Cobra spat on my face, venom. And I am allergic to snake venom and to the snake antivenom. This is my last time in Brazil. Of course I'm in good hands, you know, the Brazilian ladies, but... inside you know, I had all of this allergic reaction. Three friends of mine passed away from snakebites, so you have to be very careful. 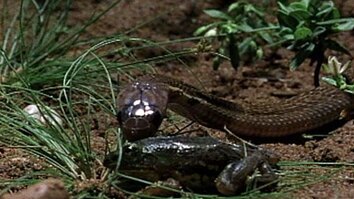 Anyway, so after all of this risk taking you are in a position to catch a snake. And this is how I did close to 40 years ago back in Hungary. And this is what happened in Micronesia. So ladies and gentlemen, this is the moment why we traveling. I'm holding 200 toxins in my hand, which has never been studied and we just don't know what kind of possible medications can be extracted from it. And this is how we get the venom. We're getting in a form of a tissue samples, from the DNA we can recreate every single toxin, and then we let the snake go. Sometimes I do bring back live snakes to the US and whenever I tell the taxicab driver what I got in the box those are end up my fastest rides from JFK to the city. And finally I mention the toxin libraries. So what you see here, this is a designer toxin. A toxin which came from a toxin library like that. And has a promising drug lead for autoimmune disorders like multiple sclerosis and rheumatoid arthritis. So, this is why we traveling. So, I'm finishing my talk with this incredible creatures. They hold the key for future medications. And this is the place where they live. This is the home of the snake, which give a medication, which is one of the most successful in the history of entire medicine, treating more than 40 million patients worldwide. This is the Iguazu Falls. So, next time when you go here remember that behind this beauty you have these incredible creatures and they can save your life. Thank you.